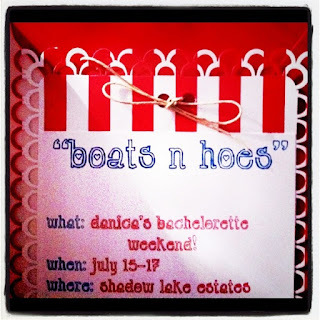 Not So Cli-Shéa: "Boats N Hoes!" For those of you who are unaware, Danica and I are OBSESSED with the movie "Step Brothers". 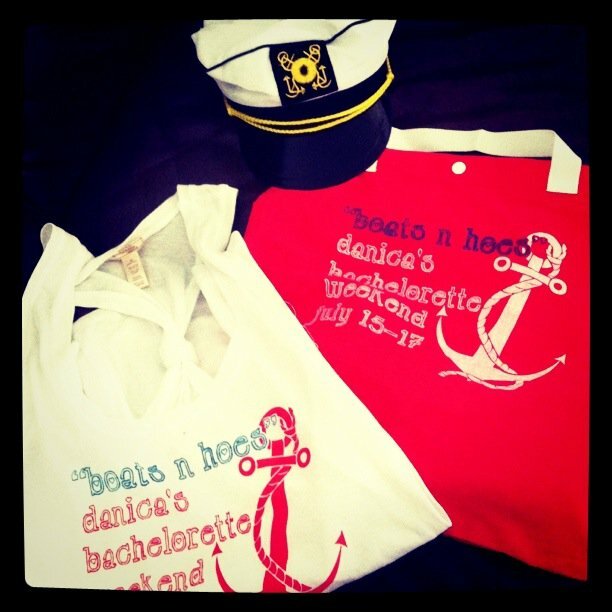 When it was time to plan her Bachelorette Party it was a no-brainer that the theme had to be "Boats N Hoes". If you have never seen the movie, well, first of all, I feel bad for you and you should watch it immediately, but here is the "Boats N Hoes" music video. Danica and I know EVERY word to that song and find it absolutely ridiculous and hillarious. So, once I had the theme idea the fun began! :) I stumbled upon these ADORABLE light blue and red anchor decoration at Target and that is when the creative juices began to flow. Once I had the adorable table wear (plates, napkins, cups and silverwear), I thought to myself, we need a photo backdrop. If you know me, you know that I'm obsessed with photos (and photo backdrops). As you can tell, I made one for Danica's 21st birthday also. In my opinion, an event isn't an event unless you get t-shirts made. So, I had my friend Frankie at "Triple Force Grafix" help me put together some ADORABLE shirts and tote bags. I made the invitations myself and when I did I found a font that I fell in LOVE with. So, I sent over the font to Frankie and my design idea and he put together probably the cutest shirts and bags I have ever seen. 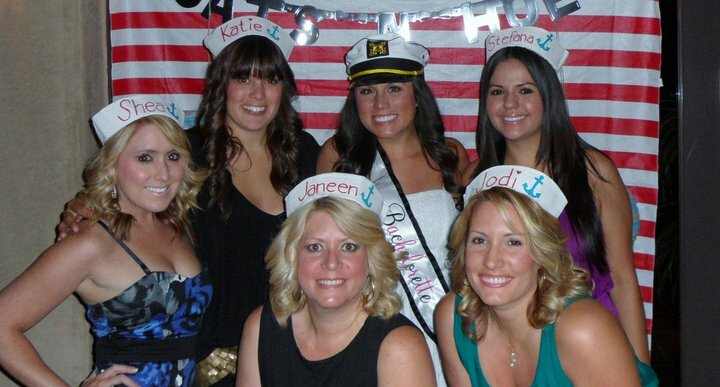 Going with the theme I got Danica a capain hat and made a cute sailor hat for all of the other girls. We got there pretty late on Friday night so we picked up some pizzas, made some drinks, and got right into opening presents! After Danica finished opening her awesome (and somewhat embarassing) gifts, we played a round of "Dirty Minds" and then busted out the Kareoke machine. Who doesn't love Kareoke?! The shirts and hats were a hit. 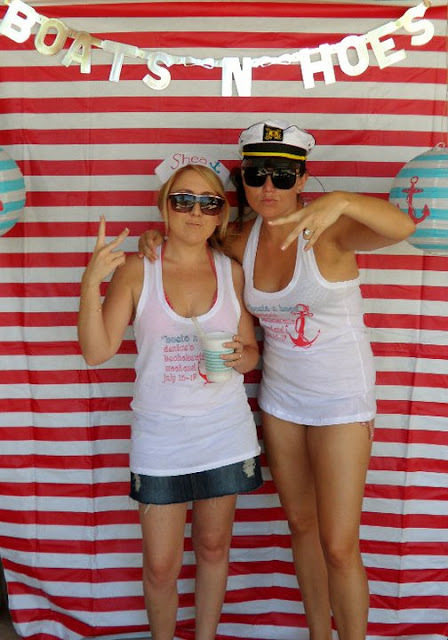 We wore them all day by the pool on Saturday. AND we even wore our hats when we went out Saturday night! We﻿ spent Saturday night at the 12th Floor Loung at Fantasy Springs Casino, right up the street from the house. It was so much fun. We started the night off with a couple of bottles of champagne and then we headed downstairs to Lit, the nightclub. It was definitely a great place to people watch. I even added to the things to gawk at when I busted out my "Toddlers in Tiaras" routine. I had everyone hysterically laughing. It was such a great weekend with such a great group of girls. I can't wait until this weekend when my best friend becomes a Mrs! I'm so honored to be her Maid of Honor and can't wait for this weekend! 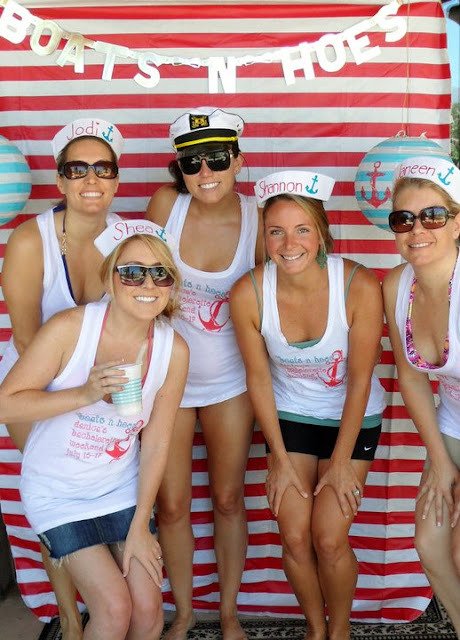 Yachts Seattle is specialize in personalized, private luxury yacht charter with one focus: "What are the best yachts, crews, itineraries, locations, and dates for you?" Book online now! Boats and all surroundings have been placed for the success of the citizens. This has been engaged for the offerings of the highest sores for the people. The peculiar shape of the format has been inducted for the systematic use of the norms for the citizens.